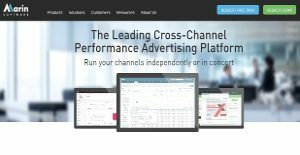 Marin is a cloud-based application that provides businesses with a unique online ad management solution, allowing them to manage search, content display, and social management through a smartly integrated platform. It comes with an advanced audience targeting suite, thanks to which you can understand and segment audience in a logical way, and develop a separate strategy for each group using the most appropriate display features. The platform connects the three vital modules that let small businesses achieve big results: The search feature can be considered as the leading edge technology of this product, as it combines advanced optimization, intuitive design, and massive scale processing. The social feature, on the other hand, is fueled by cross-channel information so that it will respond to the requirements of different social advertisers. Finally, Marin’s display feature is a transparent re-targeting and prospecting solution developed with cross-channel marketing in mind. To start with, the social feature helps SMB marketers reach targeted users across Twitter, Facebook, and Instagram. It uses an advanced cluster technique to build audience personas depending on all relevant targeting attributes, after which it activates those personas for the marketer to make smarter decisions. In fact, what Marin does is to promote enhanced engagement via organic social content based on custom rules. In such way, you will have all necessary web-based reports, where all updates are done in real-time, and all marketplace shifts are followed closely. The search function allows small businesses to expand their keyword base, detect new audience, and drive online traffic to maximize the success of their campaigns. Opportunities are spotted instantly thanks to the analytic-to-action feature, meaning that the marketer can take immediate action. The best part is the possibility to sync copies from your Google accounts, distinguish ads into groups, and associate campaigns with the ones of other publishers. Most of the heavy-lifting is done by the patented bidding algorithm that drives users towards dramatically higher ROI rates. Finally, most of the product’s cross-channel capacity is collated in the display feature, which makes it critical to advertisers in terms of re-targeting and mobile exchange. Thanks to it, you can build, launch, and manage all sorts of display campaigns for different devices, and share them with users in only few minutes. There are also numerous ad exchange integrations that help you spread your influence via programmatic prospecting, conversion, and look-like modeling. Observed closely, every operation performed with Marin will be easy because of the neat and friendly interface it offers. Every company is different, and can require a special Campaign Management Software solution that will be fit for their business size, type of customers and staff and even particular industry they support. It's not wise to count on getting a perfect software that will be suitable for every company regardless of their history is. It may be a good idea to read a few Marin reviews first and even then you should remember what the software is supposed to do for your company and your staff. Do you require a simple and intuitive solution with only essential features? Will you actually use the complex functionalities required by experts and large enterprises? Are there any particular tools that are especially practical for the industry you work in? If you ask yourself these questions it will be much easier to find a reliable app that will fit your budget. How Much Does Marin Cost? Marin is priced on quote-basis, meaning that each user receives an individually tailored price based on his needs and expectations. Contact the company for enterprise pricing, and ask for your quote. We realize that when you make a decision to buy Marketing Software it’s important not only to see how experts evaluate it in their reviews, but also to find out if the real people and companies that buy it are actually satisfied with the product. That’s why we’ve created our behavior-based Customer Satisfaction Algorithm™ that gathers customer reviews, comments and Marin reviews across a wide range of social media sites. The data is then presented in an easy to digest form showing how many people had positive and negative experience with Marin. With that information at hand you should be equipped to make an informed buying decision that you won’t regret. What are Marin pricing details? What integrations are available for Marin? If you need more information about Marin or you simply have a question let us know what you need and we’ll forward your request directly to the vendor.